One of the quickest ways to give your home a fresh, new look is to give your concrete patio or driveway an instant facelift. You can paint a concrete patio to look like stone, but it will weather, fade and chip over time even if you seal it. Before you spend all of the time and trouble to paint a flagstone patio, consider using concrete stain instead. It is a beginner-friendly way to up your curb appeal without breaking either your budget or your back. There are two basic types of concrete stain. Acid stain is used by professionals. It reacts chemically with the concrete to change its color. This type of stain is permanent and usually will not fade. Acid etching stain is available to non-professionals, but it is trickier to use and you don't have that many color choices. The second type of concrete stain simply sprays, spreads or rolls on. It is available in a variety of colors, and although it may fade over time, a good sealer can prolong its life. Concrete stain will not penetrate the surface of your patio or driveway if it has been sealed. Scatter some water on the surface. If it sinks in, your concrete only needs to be cleaned. If the water beads up, you will have to strip the sealer off. Commercial strippers are available at home improvement and hardware stores and online. Follow the directions on the packaging and wear full protective gear. Keep children and pets off of the surface you are stripping. Once the stripping process is complete, rinse the surface thoroughly with clear water. A wet/dry vacuum or large squeegee will help remove the surface water. Allow the space you intend to stain to dry thoroughly, which can take from four hours to overnight depending on the temperature and humidity where you live. Concrete stain works best on a clean, grease-free surface. Sweep your concrete with a good quality broom, making sure to remove all dead leaves and other debris. Treat and remove any mold with a commercial mold killer. Make sure that you remove all traces of this chemical so that it does not interact with the concrete stain. 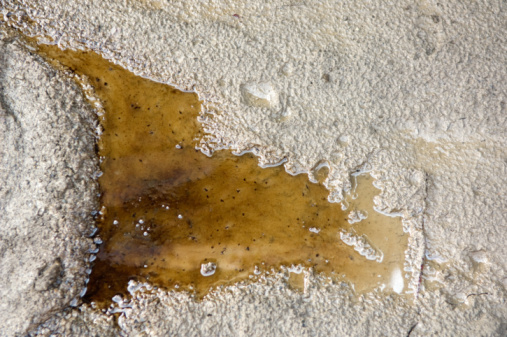 If you are staining a driveway, remove any oil stains with a commercial degreaser. Follow the manufacturer's instructions as to dilution, if that is required, and make sure that you wear goggles, long sleeves, long pants, sturdy shoes and gloves. 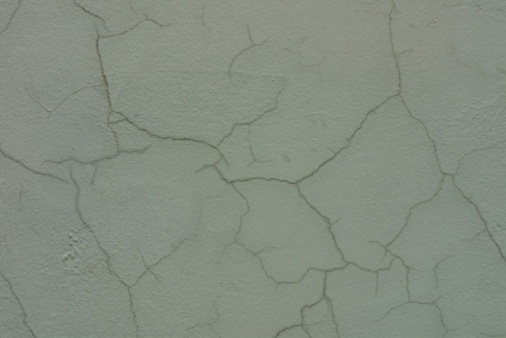 Some concrete stains have more than one step to them, such as a dry powder followed by a liquid activator. This is more likely to be the case in the commercial acid etching concrete stain. 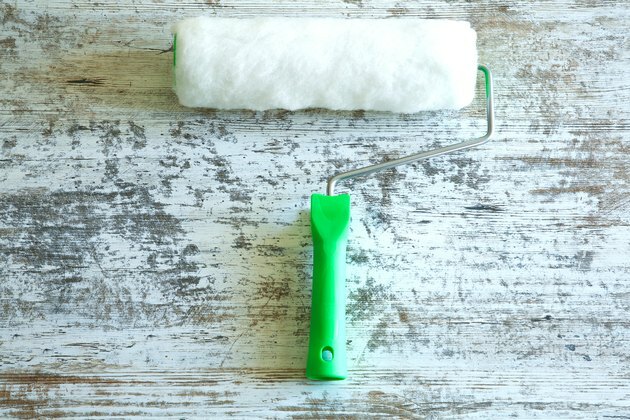 To get a wider choice in color, go with a do-it-yourself stain that simply sprays, spreads or rolls on. Wear full protective gear and be mindful which way the wind is blowing because you don't want the stain blowing back at you. Some concrete stains work best when applied to wet concrete so make sure you read the instructions before starting. Use a garden sprayer, nap roller or sponge mop to apply the stain in random, even strokes to completely cover the concrete. Do not work in parallel stripes or you might end up with weirdly consistent brush marks rather than more natural coloration. Once the first application is finished, let it dry for at least four hours. If the result is not dark or vibrant enough, apply a second coat. Make sure that your concrete sealer is compatible with your stain. This is best done by sticking with the same brand for both, but read the labels to be certain. Apply the concrete sealer according to the manufacturer's suggestions. Just as with the stain, this can be done with a garden sprayer, sponge mop or nap roller. Apply the stain in thin, even coats, being careful to thin out any thick ridges where your strokes overlap. Once the entire surface has been covered, let the sealer dry. This can take between two hours and overnight. Again, reading the instructions is crucial because if you feel that you need a second coat of sealers, some brands will not adhere if the first coat has been allowed to dry for too long. Allow the surface to cure for a minimum of 12 hours before using it.